Bookride: Interaction of Color. Josef Albers, 1963. Josef Albers. INTERACTION OF COLOR. Yale University Press, 1963. I see this slip-case sometimes described as a box (a 'cloth drop-back box' on one occasion.) It can show up with less than its compliment of plates - one seller explains (he had 79 out of the 80) - 'Apparently it was common for the publisher to miscount in this particular book and not include all of the screen prints.' All copies in auction have had 80, although I have seen people selling the Mark Strand ones separately but only for a few hundred dollars. Not sure how many were printed but copies seem to show up almost every year, none on net at present, although Google reveals a dealer with one with 'price on demand' - usually means an unpalatable sum. I recently came across the "folio" or box with 79 folders, serigraphs & dust sheets, but no book. I would love to complete the set before trying to sell it, but am unsure what the book actually looks like. Is the artwork on your site also printed on the front of the book? Or is the book covered in brown cloth similar to the box itself? Where can I find a list of the numbered serigraphs so that I can determine if there is a missing folder? I own a complete box set of the original Interaction of Color (1963) - all books and plates in excellent condition. (Probably viewed less than a dozen times) I replaced the original acid paper liners (which were still with each plate when I bought it from a public library) with archival glasscine to protect the screenprints. Note: Some of the plates are actually offset lithography as they are reproductions of course projects using collage materials and color models. I have used it for post secondary educational purposes on color theory - but find the lessons limited and redundant. Best kept and valued for the quality of the screen prints which are sooooo rich and elegant that the Albers structural imagery influence is evident. I wish to sell only to a serious collector or advanced library collection. Please post a comment on how you may be contacted re the sale of your complete folio. Late in the game on this item, but I have one that's the complete folio (with all 80 serigraphs/lithographs (all with liners). Interested in selling. Wondered if there was more up-to-date pricing/sale $ info, and if Swann was still 'the' best place to go with it? Thanks for the advice! (If I lived in England I would use your shop to sell it!). I have the set (book and original serigraphs/lithographs) that is in very good condition (rarely viewed). Any interest from a serious collector or library? It is of sentimental value and I wish to sell to someone who understands its value to the art/design community. Does anyone know what the Interaction of Color prospectus is worth (sent in a bifold with folder VI-3, sample commentary, and an index)? I have the original 1963 slip case set in excellent condition with all 80 serigraphs/lithographs. This was a gift to me, but I am currently looking to sell to someone with an equal appreciation for rare art books. If you are seriously interested, please contact me: lorna at lornanakell dot com. 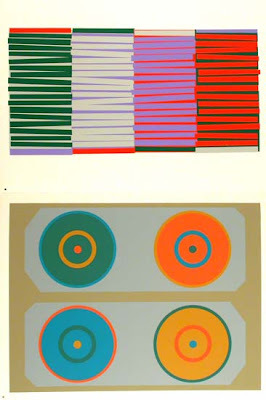 I am possibly willing to sell my complete, original and flawless 1963 edition of Josef Albers Interaction of Color. Please contact me via email, Thank you. Who is willing to sell an original copy of Interaction of colour to Bergen Academy of Art and Design? We are building a colour lab and want to include this volume. The Plates are a complete set of 80 Serigraphs/Lithographs and ALL are in perfect untouched condition. In fact I have never taken them out to study, only to verify their condition and wholeness. This is a remarkably well preserved edition. It has been a family Heirloom passed down from my father who worked at IBM in Poughkeepsie, New York and I hate to part with it but I am in the midst of starting my own Architectural Firm "ArcFormz Site + Building Design"
Please contact me Rick via email: ArcFormz@gmail.com, Thank you.